The Blackberry is the aggregate fruit of the Bramble bush, a native plant throughout Europe. Blackberries are easily confused with rasberries but their core is hollow while blackberries have a light green core. The fragile skin of the Blackberry is green and hard when young, turning red as it ripens then black and shiny when fully ripe. The immature fruit is small and sour, while the ripe fruit is larger in size, juicy and sweet to taste. In late summer and autumn, blackberries can be picked and eaten, or made into pie filling, jam, jelly, and tea. Also known as bramble. A large, deep purple berry that grows wild on thorny bushes. In england blackberries are often combined with apples to make pie. It´s a very good source of vitamins C and K and of manganese. A blackberry is a fruit, slightly larger than a blueberry, that is actually a cluster of smaller fruits. Each fruit, called a drupe, has a skin, surrounding juice and a seed. Choosing: Choose blackberries that are firm, deep in color, and clean. Buying: Blackberries are widely available. Procuring: Blackberries grow in many types of soils, with good drainage and pH of 5-7. They need warm temperatures to thrive. Most blackberries are produced in Oregon. 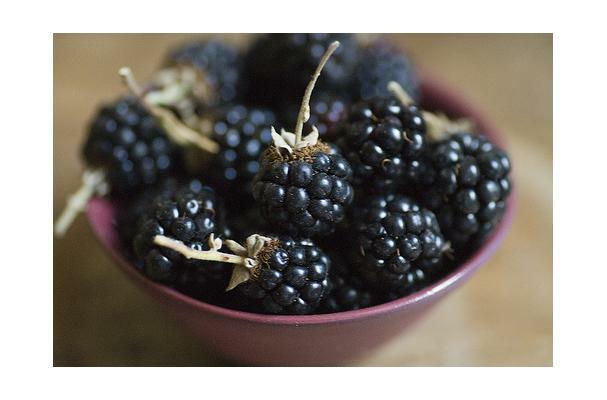 Blackberries are great to eat fresh, and can be used in a variety of desserts, such as pies, cakes, and ice creams. They also are used to make jellies and jams. Also, blackberry leaves are used to make tea. Cleaning: Simply rinse and eat or store. Blackberries should preferably eaten immediately. Or they can be stored in the refrigerator for two to three days, lightly covered. Blackberries are a popular source of nutrients and antioxidants.